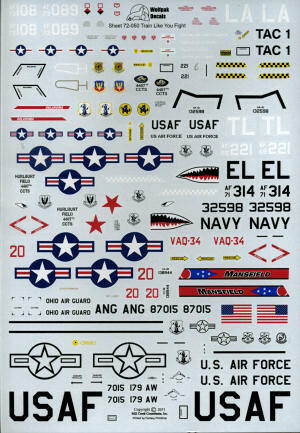 This next sheet from Wolfpak Decals has more of an interesting mixture of subjects, mostly USAF as seems to be the norm. 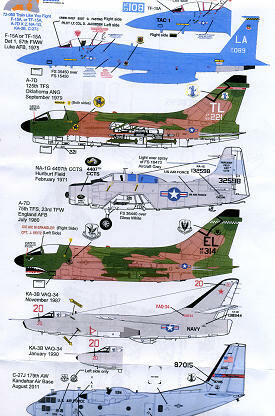 There are seven aircraft on this sheet and in schemes that most of us dealt with in the past. First up are a pair of Eagles in Air Superiority Blue. These are from the 57th FWW from 1975 when they had a detachment based at Luke AFB. You have a choice of a standard F-15A or a TF-15A (later F-15B). Next is a 125 TFS Oklahoma ANG A-7D during the short period that they used TL as a tail code before switching to the OK one used thereafter. This is from September 1979 and the aircraft is still in the SEA camouflage with the light grey underside. Third aircraft is an NA-1G from the 4407th CCTS at Hurlburt Field in 1971. This aircraft is in shown in FS 16440 Light Gull Grey over white in the standard USN pattern. The tail band is done in ADC Grey FS 16473. A second A-7D is with the 75th TFS of the 23rd TFG at England AFB in 1980. This is in the full SEA wraparound scheme the unit used before the group went to the A-10. Next, a KA-3B with VAQ-34 in late 1987. Standard Light Gull Grey over White camo scheme with an option from 1990 with a TA-3B nose. Finally, the most modern option on the sheet is a C-27J as currently used by the 179th AW, Ohio ANG when seen at Kandahar in Afghanistan.